It's talking about how Edgar Prado (jockey) first met Barbaro. He wasn't even riding him!! 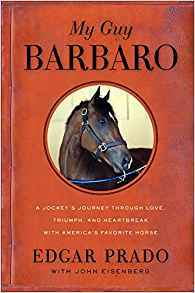 It also talks about Edgar's life, and how Barbaro changed the world, and what his destiny was. It's really well written by Edgar, the jockey. You have to get this book! This is a story about a girl called Irina and she's really lonely then she finds a rocking horse called bella and cleans it and one night she comes alive...! I'd recommend it to anyone who likes animal stories and anything horse or pony related..
Return to Share Your Favorite Classic Horse Books!.